The Incanto di Roma Bed & Breakfast is located in the heart of Rome and offers stylish accommodation at very reasonable prices. Situated in an atmospheric 19th century building, this recently refurbished bed & breakfast combines the character of the Eternal City with the style and comfort one should expect from a modern hotel. L’Incanto di Roma offers a top quality service at youth hostel prices and is the ideal place from which to set out and explore Rome for those travelling on a shoestring budget. 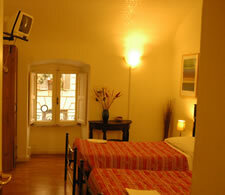 What can you expect from a stay at the L’Incanto di Roma Bed & Breakfast? Above all you can expect great value for money. An outstanding location in the heart of the city, L’Incanto di Roma is within walking distance of many of Rome’s most famous monuments and tourist attractions including Piazza Barberini, the Spanish Steps and the Trevi Fountain. We are a stone’s throw away from the subway and we also offer easy access to every other major form of public transport making L’Incanto di Roma a superb base from which to enjoy this magnificent city. You should also expect style and comfort. The Incanto di Roma contains 4 rooms that have been completely refurbished and renovated in an elegant manner and the delightful nature of this cheap B&B is topped off with a range of services including internet access and a full continental breakfast served by our warm and friendly staff. Visit L’Incanto di Roma Online Booking Office now for further information on our unbeatable rates.